Did you think we actually swam with Dolphins? Well, no we didn't, but this is about as close we got to any Dolphin viewings on our cruise! 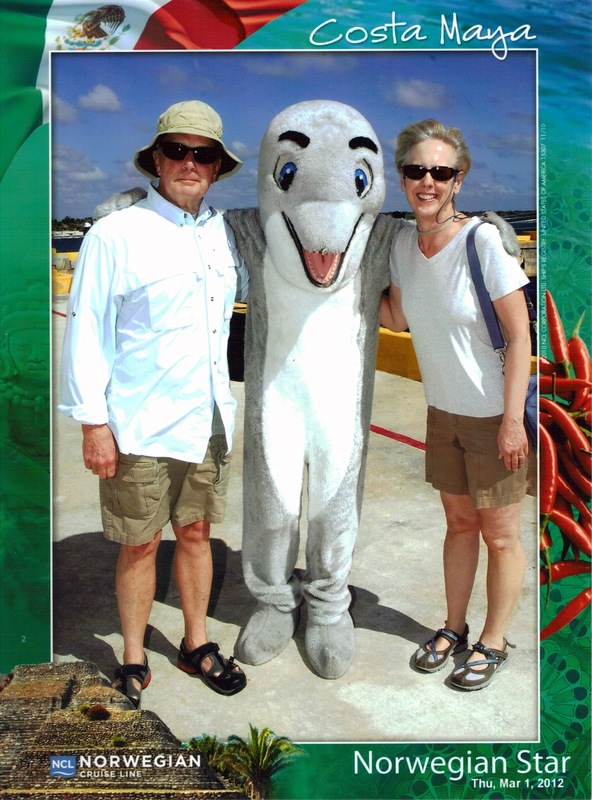 This is our "official" cruise photo - a long way from this one, but at least we have a sense of humor! I was going through our trip photos and realized they are pretty mundane. 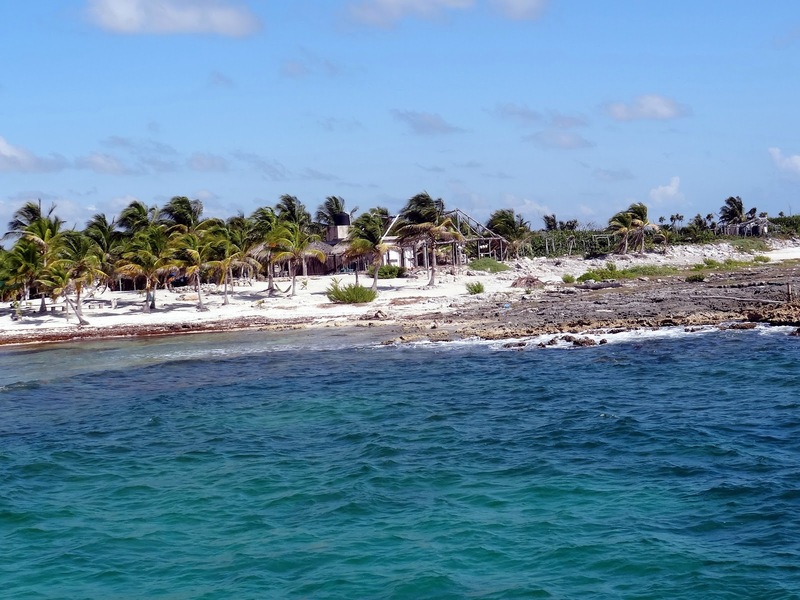 We had a bottom fishing trip scheduled while in Cozumel, but Norwegian cancelled it the day before which left us a bit disappointed. So, no fish photos, but a few with some pretty scenery. 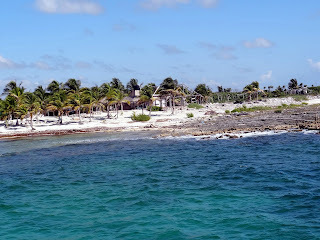 This is Costa Maya. Just a tiny village with lots of flat, tree scape behind it. 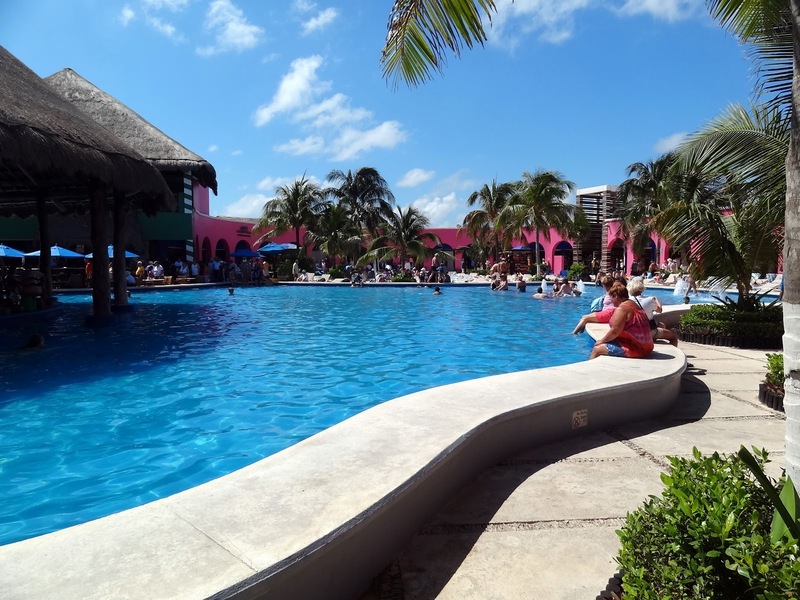 This is actually the duty-free shopping center in Costa Maya - fully equipped with a swimming pool so you can cool off and take a break from shopping! I've never seen anything like this! We only bought one t-shirt for Mr. Squash during the entire trip! Each duty free shopping center had the same "crafts" which all looked to be mass produced probably in China and nothing that I thought was worthy of bringing home. 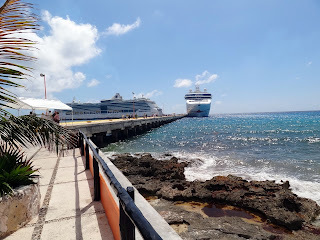 Looking back at our ship on the right from Costa Maya. 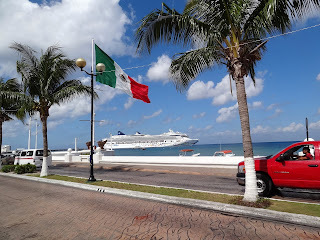 Looking back at our ship from Cozumel. The duty free area was enormous but we found our way out to the city itself and wandered around for a while. This port was much larger and more civilized than Roatan or Costa Maya. 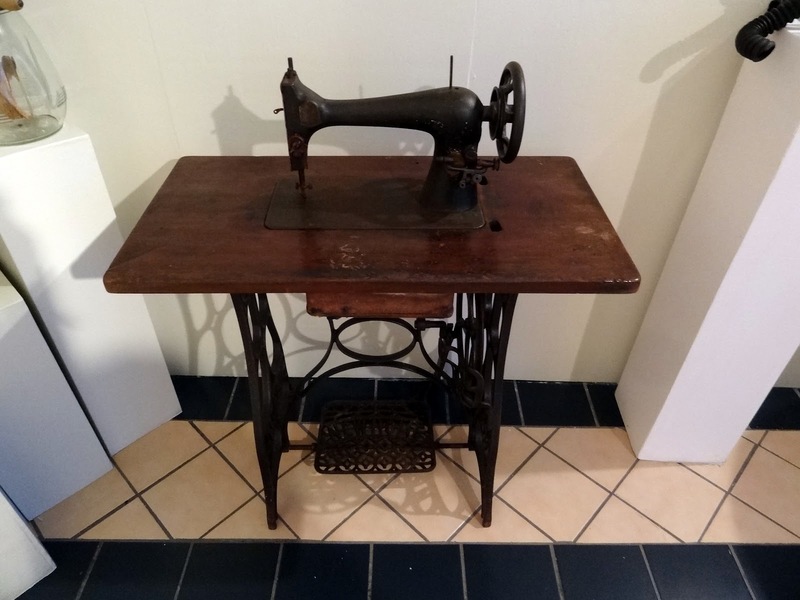 We found the local museum in Cozumel and I was surprised to see this vintage sewing machine! Also at the museum was this great vintage steam iron! 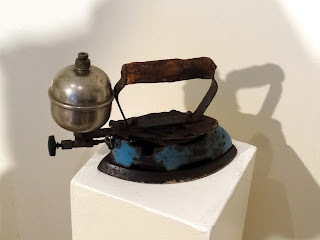 Talk about heavy - I suspect there were a lot of women with hefty ironing arms after spending a lot of time with this! I think this will be our first and last venture into the Western Caribbean. We much prefer the southern parts of the Caribbean. Now we're looking into where to go next winter for a warm getaway! Any suggestions? I really enjoyed all your photos! The scenery looks so pretty. You know my favorite photo is the one with the dolphin!!!!! Classic. Dolphin Christmas card photo for sure. 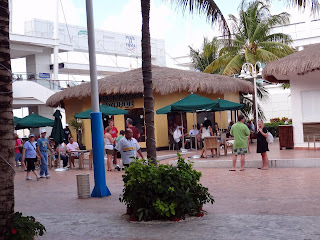 I hope cruising next year is tons better, with excellent ship lattes. Looks like you had a wonderful trip ! Love the dolphin picture. Thanks for posting all of your lovely pictures from your trip . Just beautiful ! …and oh my what a trip this has been. So eventful. I couldn't believe the rescue at sea. I mean, how often does someone get to see that?! Sheesh. And boy you sound like that latte was just what the Dr. Ordered!!! That steam iron is a real treat as I've never ever seen anything like it. Never. My arms hurt already. You know, I have no suggestions for vacation because I'm heading back your way to the mountains when I do my turn. …which is going to be soon! No quite walla walla but 3k miles and elevated regardless. Home. Not very exactly to be honest. No good lighting for stitching either. Dang parents. At least it was warm! I recommend Hawaii. Rent a condo and go from there. It's our favorite destination! Love the dolphin pic Candace! Of all the caribbean cruise itineraries, my most favorite is the southern then I like the eastern and western is my least favorite. Although, I do love Jamaica. But you can just fly there if you want to. I found and took a picture of a 'red' sewing machine in Curacao a couple of years ago. I'll have to send it to you. Glad you had some time off the ship and found something interesting beyond the tourist shop "usuals". I'm hoping your drive back from Seattle is pleasanter than the drive TO! Great photos and what great weather too.